Sending today's gold price higher for the third consecutive day was news that North Korea has tested a hydrogen bomb. Western intelligence sources said the detected blast was not big enough to be an H-bomb. Still, the reports were a stark reminder that North Korea possesses nuclear weapons and is prepared to use them. The news sent global stock markets reeling. U.S. equities opened sharply lower. The Dow Jones Industrial Average tumbled 212 points, or 1.2%, to 16,948. The S&P 500 declined 1.1%, and the Nasdaq Composite dropped 1.5% on the open. The Stoxx Europe 600 was down 1.8% in afternoon trading. The MSCI Emerging Markets Index slid 1.1% to the lowest level since July 2009. All but one of the 10 industry groups retreated. Technology companies led declines, tumbling to the lowest level since September. Benchmark gauges in Hong Kong, Taiwan, and Saudi Arabia dropped at least 1%. In addition to the alarming news out of North Korea, more disappointing data came from China. That news also had a major impact on today's gold prices. The Chinese Caixin Services Purchasing Managers' Index came in at 50.2 in December, down from 51.2 in November. The December number was the lowest in 17 months. That followed dismal manufacturing data from the Asian nation on Monday that sent world markets spiraling. The Caixin China Manufacturing Purchasing Managers' Index fell to 48.2 in December from 48.6 month over month. A reading under 50 indicates contraction. December's read marked the 10th consecutive month the figure contracted. The world currency markets were also rattled Wednesday as the Chinese yuan sank to a five-year low and fell to a record low versus some currencies. Falling crude oil prices and the deflationary implications continued to distress global markets. Brent crude oil futures fell to an 11-year low Wednesday. 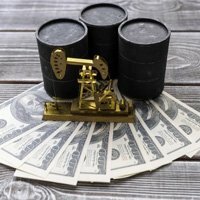 Crude oil prices dipped below $35 a barrel on Wednesday. Middle Eastern tensions remain elevated. Hours after Iranian protestors set fires in the Saudi Embassy on Sunday, Saudi Arabia announced it was severing ties with Iran. The situation in the region remains grave. Gold prices rallied 2% on Monday on the rising tensions in the Middle East as well as a rocky new year start for world markets. Three days into 2016, the gold price is higher by just over 3%. Gold prices have been trading in a cyclical bear market since 2011. Gold ended 2015 down 10.4% for its third straight annual loss. The yellow metal finished last year just slightly above its near-six-year low of $1,045.85 an ounce hit in early December. 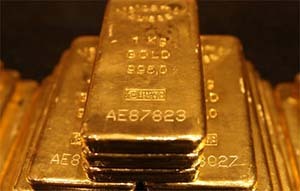 That has made today's gold price attractive to bargain hunters and those concerned about equities. Worried about stock market volatility and a topping out in equities, UBS technical analysts Michael Riesner and Marc Muller told clients in a research note on Wednesday morning that they should take a serious look at gold. "In 2016, we expect gold and gold mines moving into an eight-year cycle bottom as the basis for the next multiyear bull market. Initially, we see gold profiting as a safe haven and as of 2017, gold could profit from the U.S. dollar moving in a major top and starting a bear market," the analysts wrote. Money Morning Resource Specialist Peter Krauth has been sharing a similar bullish position on gold prices for months. Citing a softening in the U.S. dollar and a clearer picture of the Fed's monetary policy path, Krauth says gold prices could see some stabilization.